Across this great country there are dozens of giant Muffler Men, Big Johns and Uniroyal Gals. In the 1960s these advertised Mufflers, Tires, etc. Nowadays they can be seen at state borders, at tourist spots or advertising cafes (see Blackfoot, ID in my A to Z Challenge posts as an example). I have written a post all about these giants HERE. Then there are folks like Glenn Goode (who passed away in March 2015). Known as the Fiberglass Man because of his collection of these giants, he was in the fiberglass and sandblasting business for over 44 years. On his property on Walnut Bend Road, Gainesville, he had five big fiberglass people . See my full post about his unique site in the middle of nowhere HERE. Back in 2007 I ventured west to Washington with my son for some shows with Antsy McClain and the Trailer Park Troubadours. Along the way we visited a number of states and places. One of the more unique stops along the way was in the town of Gothenburg, Nebraska. This town is apparently one of only two Gothenburgs in the entire world, the other being the famed city in Sweden. Gothenburg is probably most well known as the home of the Pony Express in Nebraska. The town has become somewhat of a tourist attraction with the Pony Express building and also the Sod House Museum, which is just off of Interstate 80 at exit 211 to the left as you go into Gothenburg. The Sod House Museum was dedicated to the settlers of this area who initially built their homes out of sod. Also at the Sod House museum are two barbed wire sculptures including an Indian and a Buffalo. Both have well over 4 miles of barbed wire in the work. See my write up about this 2007 visit HERE. Guthrie, Kentucky is located at the junction of US Highway 79 and US Highway 41 near the Tennessee Border. I ventured through here on my way to Memphis and the Blues Highway in the fall of 2014 (see a couple of other A to Z Challenge towns in earlier posts including Alligator, MS and Brownsville, TN from this same trip. Paris, TN and Paris, TX will also be included in my P Towns post.). Guthrie has its own version of a Pink Elephant (different from the one I posted about in DeForest, WI in my D Towns post). They also have a pink sunglass wearing giant cow. You can see full details of this visit and more photos HERE. Gregory, South Dakota is another town along the Oyate Trail. South Dakota is the pheasant capital of the U.S. and this area of the Oyate Trail is one of the centers of the pheasant hunting world (and, in Gregory there is also a Gorilla or two….). Apparently Gregory is “The Ground-zero of Pheasantdom” according to Fortune Magazine in 1992. You can read more about my visit to Gregory and see some photos of old movie theaters, interesting bars, etc., in my 2013 Oyate Trail post, which can be seen HERE. Galata, Montana is one of two Montana and US Highway 2 Hi-Line towns I am including in this G Town post. Located about 23 miles east of Shelby, Montana, Galata is practically a ghost town. But the 1960s era neon sign advertising the Motel Galata is a classic. Definitely something worth looking for on a roadtrip across northern Montana. On the eastern end of Montana on US Highway 2 is the town of Glasgow, Montana. A town of about 3000, it is a colorful place with all sorts of dinosaur lore. As one proceeds west on US Hwy 2 out of Glasgow, you will see dinosaurs up on the hillside. These and the other animals and sculptures (as well as the dino at the Hangar Bar) are all creations of artist Buck Samuelson, who offers them for sale. Read more about US Highway 2, the Hi-Line Drive across northern Montana HERE. There are apparently 21 places in America named Glasgow that range from a tiny town in Fallen Timber County, Pennsylvania, which has 63 inhabitants, to Glasgow, Kentucky the largest of them all with a population of just over 14,000. As a Kentucky resident, I have visited many of the towns and Glasgow is unique because of its cultural depth with an amazing old Theatre and its many wall murals. Founded in 1799 by a group of Revolutionary War veterans, Glasgow boasts historic homes and buildings, the South Central Kentucky Cultural Center, downtown walking/driving tours, Barren River Lake State Resort Park and Brigadoon State Nature Preserve. The town sits at the intersection of US Highway 68 and US Highway 31. Montana is a huge state and so it is not a surprise that this post has three G Towns. I would be remiss if I didn’t include Gardiner, Montana, which is situated in Southwest Montana, at the North Entrance to Yellowstone National Park. The town is nestled in breath taking Paradise Valley, with the Yellowstone River running right through town. The Roosevelt Arch is the most famous structure in Gardiner. 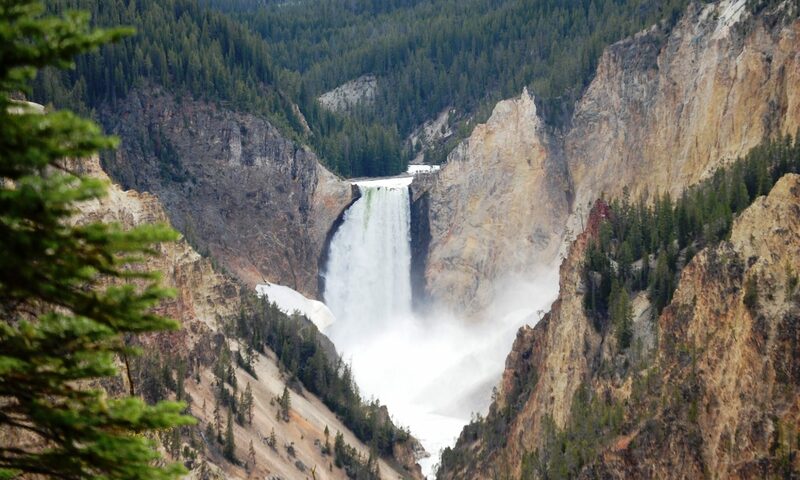 This Yellowstone Entrance, Gateway or Arch was dedicated by President Theodore Roosevelt on 24 April 1903. The arch is visible two miles north of Gardiner on US Highway 89. See more about my 2014 trip down Montana’s US 89 and Yellowstone HERE. In June 2013 I made my way to Rexburg, ID and passed through Wyoming on my way to Yellowstone National Park. (I noted the Montana entrance above). On this particular trip I found my through Gillette, WY on my way to Cody and Yellowstone. Gillette is home of a few nice murals, an artist walk with a number of unique sculptures that change each year and then there is the Rockpile Museum. This Campbell County Museum focuses on general, regional, and local history with an emphasis on the culture and people of Campbell County. It was opened in 1974 at the site of the historic natural rockpile, which has been a piece of Gillette history since the 1890s. See my full report about Gillette and the drive to Cody and on to Yellowstone HERE. The town of Granbury, Texas, south of Fort Worth, is a fun place to visit, filled with history, an old fashioned courthouse square surrounded by unique shops and some good places to eat (especially Babe’s Chicken!!). It is home to the Nutt House Hotel (crazy name eh?). Not too far down the road is the Fossil Rim Wildlife Center, an amazing drive thru Wildlife Park in Glen Rose, TX (another G Town!) The current facility has grown to 1700 acres and has over 1000 animals, with 50 species of native and non-native animals, including Cheetah, Rhinoceros, Giraffe, various African antelope varieties, Zebras, Ostriches and Rheas, among many others. You can see dozens of photos of the park and also more on Granbury in my 2012 post HERE. Grand Forks is another US Highway 2 town also cut through by Interstate 29. I mention it here because of its famed Smiley Water Tower, one of three or four in the US (note the Adair, IA Smiley in my A Towns post). This tower has the Smiley above and on the other side of the water tower is a Winking Smiley. You can see more photos of it and also see more about my 2014 US Highway 2 drive through North Dakota HERE. Penn’s Privy – a famous outhouse! With a unique name for a place, the small village of Gravel Switch, KY. grew up around a gravel quarry on a spur line of the L&N railroad around 1870. There is not much there now but a small Amish school, a Post Office, a bank and a few houses. Not far from Gravel Switch is perhaps the most famous place in the area…Penn’s Store. According to its website, “Penn’s Store is the oldest country store in America being run continuously by the same family. It has been in the Penn family since 1850.” There is a nice writeup about it here. I drove through there on a trip to Elizabethtown, KY in February 2013. See the entire post HERE. On one of my trips back to Kentucky from Canada in 2008, I drove through the community of Gilboa, OH. Thy had a humongous steer statue and also a unique restaurant/bar called Stinky’s Country Well. Had to include Gilboa for these reasons. The town is on US Highway 224 west of Findlay, OH. Finally, on Interstate 35 north of Austin lies the historic town of Georgetown, Texas. I have had a couple of opportunities to visit there in the past few years and it is a unique place. The town features some of the best Victorian architecture in the state of Texas. And then, there is the story of “Three-Legged Willie” (Robert M. Williamson), the beloved Texas patriot, Ranger, lawyer, judge, newspaper editor, and Williamson County’s namesake. Known affectionately as Three-legged Willie due to the wooden leg he used following an illness when he was 15. His right leg drew up at the knee and could not support him. Thereafter, he wore a wooden leg, leaving his useless foot extended behind him. A lawyer at 19, he fought with the cavalry at the Battle of San Jacinto. An enthusiastic supporter of Texas statehood, he named one of his sons Annexus.